The early history of the LS3/5A has been documented by Trevor Butler in, A Little Legend, The BBC LS3/5A. originally published in HiFi News and Record Review in January 1989. The on-line version does not include the pictures from the article. Much of what follows is anecdotal and based on my memory of things my father told me about his time at the BBC. I wish now I had listened more carefully and made notes. If I have made errors or failed to acknowledge someone then I will of course include any corrections emailed to me. My interest in the LS3/5A grew from my late father, Maurice Whatton's involvement in the project. He worked for the BBC for 35 years, most of which was spent in the now defunct Designs Department. His early work involved the design of television electronics on a number of projects which included early standards conversion, the memory logic design for the ANCHOR caption generator and the electronic insertion of the BBC2 logo and colour bars into the testcard. All these designs were done without modern aids like computers and were based on discrete logic circuitry. Around 1974 my father took on a job of working on the LS3/5A project within Design Dept. The LS3/5 had been developed by T. Sommerville and D. E. Shorter of BBC Research Department at Kingswood Warren and was passed to Design Department in Western House initially for minor modification. The subsequent re-design of the speaker was intended to allow it to be manufactured outside the BBC under licence. My father had come from a background of electronic design where everything was reasonably predictable. He was not a music enthusiast and never went to concerts or listened at home for pleasure. The LS3/5A project was approached by him entirely from an engineering perspective. But his eyes (ears!) were opened by how critical the components of the LS3/5A were. At the time the LS3/5A represented the cutting edge of small loudspeaker design and I remember him showing me several examples of speakers falling both audibly and measureably outside specification because apparently minor changes had been made. On one occasion the bolts holding the drive units to the baffle had been changed (from steel to brass?) causing all the speakers to fall outside specification. On another cabinets had to be rejected because the wood used for the internal cabinet battens was changed from Beech to Pirana Pine. Although he was very much an engineer holding similar beliefs to those of Peter Walker of Quad, "if you can hear it you can measure it," my father was very quick to acknowledge Ralph Mills' "golden ears". He said that Ralph was able to listen to a speaker and know what was wrong. Ralph was apparently able to hear changes of 1dB when the accepted wisdom was that it required a change of 3dB for something to be audible. Ralph could allegedly draw a speaker's response curve after listening to it and he was always right. The LS3/5A design did depart from a flat response and was "tweaked" as a result of listening tests. Most significantly this gave the LS3/5A's frequency response its characteristic bass "bump" fooling many listeners into believing the LF response was much more extended than it really was. The design proved so popular with BBC staff that kits were made available by Chartwell for purchase by employees under the name of "Project Symphony." Rogers were horrified by this, see Brian Pook's history. These LS3/5As can be easily recognised by their screw terminals. 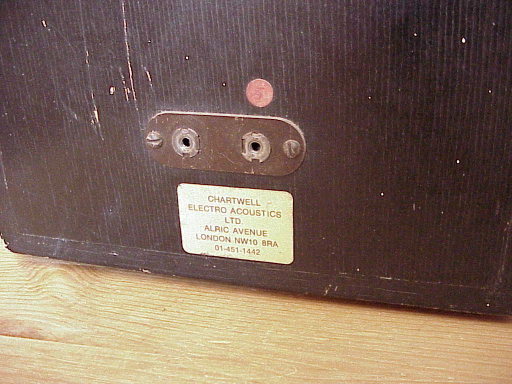 They do not have a full Chartwell label but instead carry a small label saying, "Chartwell Electro Acoustics Ltd. Alric Avenue, London, NW10 8RA". I remember going up with my father to check the pair I still use against the reference in the listening room at Western House. Although intended only for BBC staff many pairs were bought by employees on behalf of their friends. Project Symphony speakers are highly sought after when they come up for sale on the secondhand market. The specification of the LS3/5A was tightly controlled by the BBC's licensing system with the intention that any two, irrespective of date or manufacturer could be brought together in a matched stereo pair. In 1989 there were estimated to be around 60,000 pairs in use worldwide. Rogers alone had made 43,000 pairs by 1988 and at that time the BBC had 3,000 LS3/5As in use.